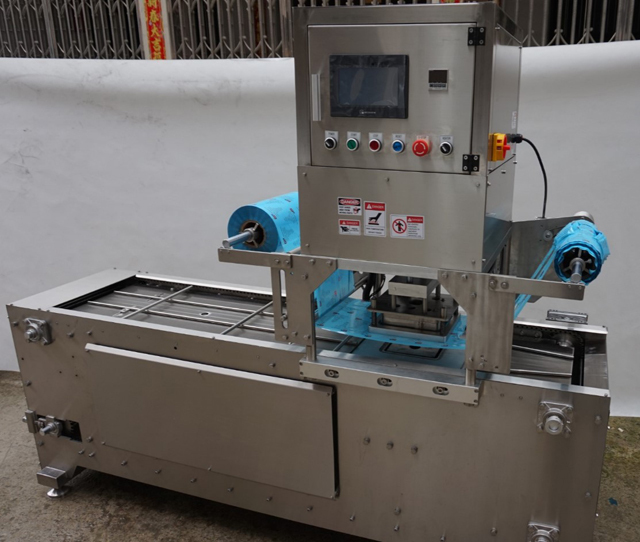 Automatic tray sealing machine can detect filled trays, auto gas flushing into tray (optional), auto sealing trays by plastic film, film pulling and positioning, auto printing the produce date(optional), auto collect the waste film, auto discharging the finish products. 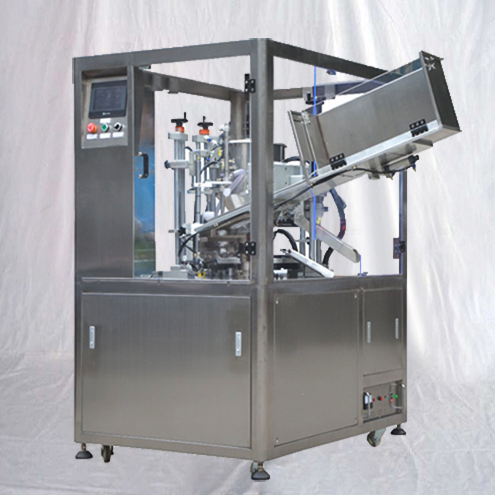 Base on different mold quantity, its capacity from 800-2400cups per hour, suitable for factory production needs. 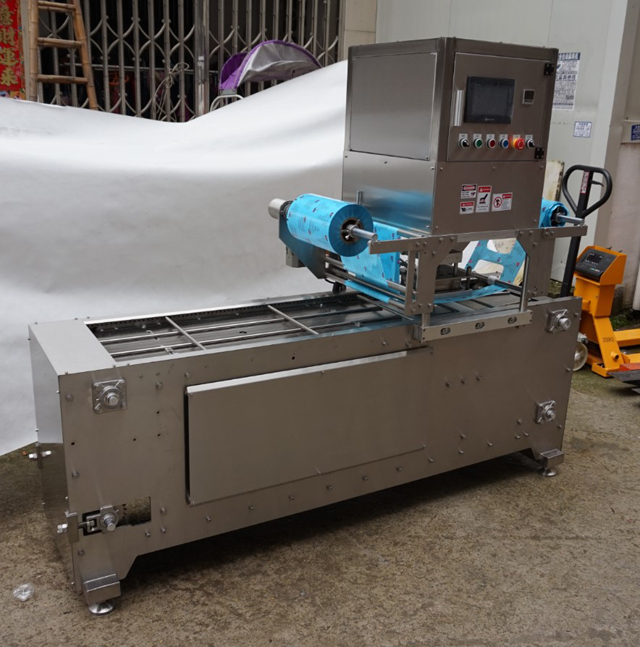 Whole machine made by stainless steel 304 and anodizing aluminum, ensure it can running on bad food factory environment which has damp, steam, oil, acidity and salt etc. 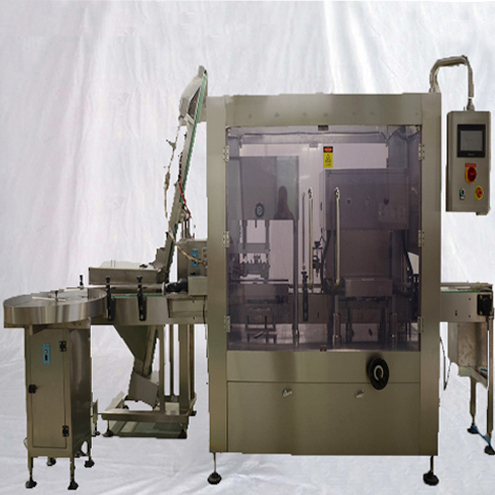 its body can accept the water rinsing clean. 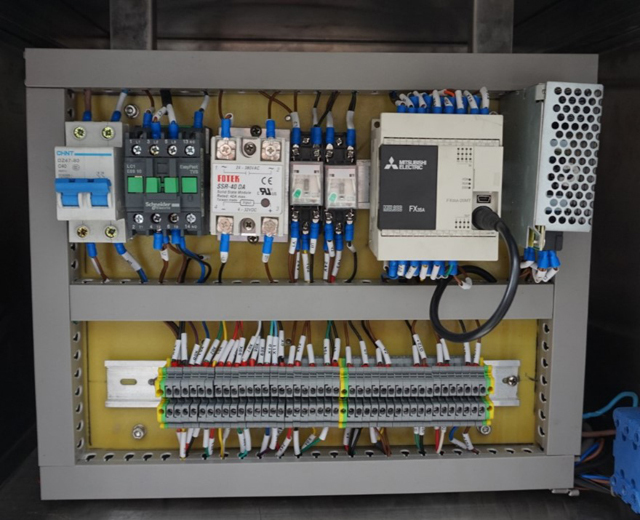 Using high quality imported electrical parts and pneumatic parts which ensure the stable running in long time, reduce the stop and maintenance time. 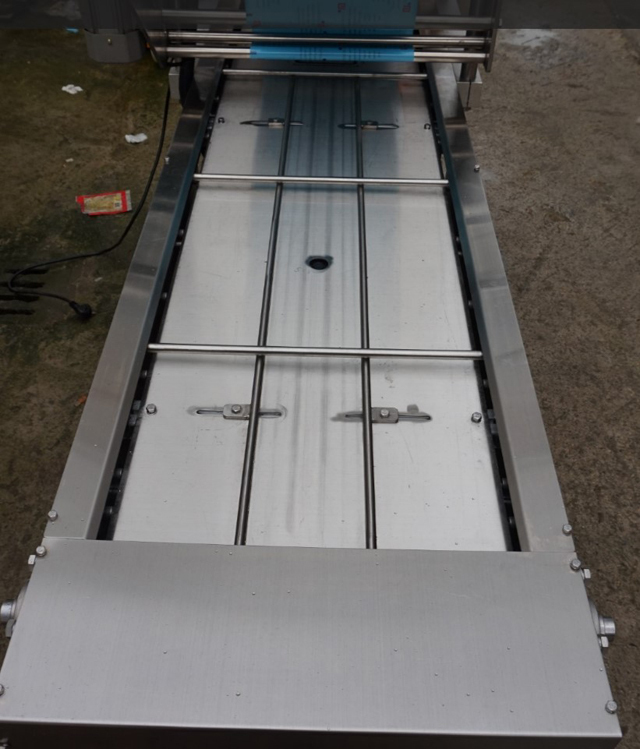 Chain driven system: servo motor with gearbox for the chain stepping running, it can move very fast but avoid material splash because servo motor can start and stop smoothly, and also high positioning accuracy. 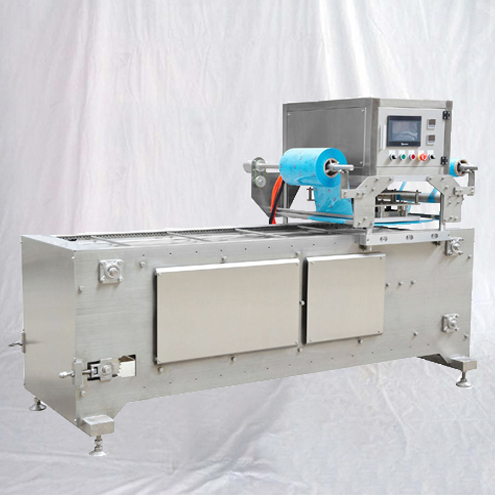 Filled tray detecting function: it uses photoelectric sensor or optical fiber sensor to detect the conveyor have or haven’t tray, it can avoid the mistake sealing if the conveyor without the tray, reduce the product waste and save machine cleaning time. 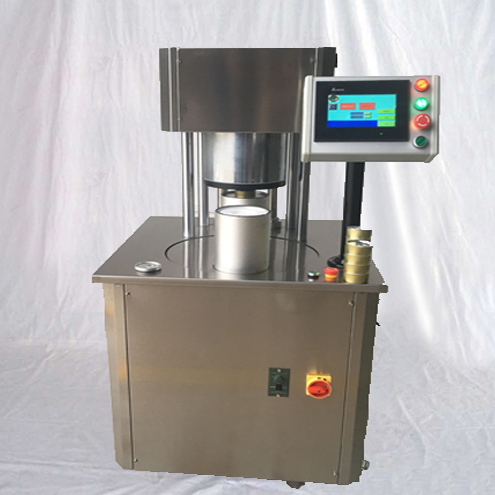 Gas flushing function(optional): the film will be press tight on top of the tray, then flushing the gas on the top of the tray, drive out the oxygen and air out of tray then seal the tray. 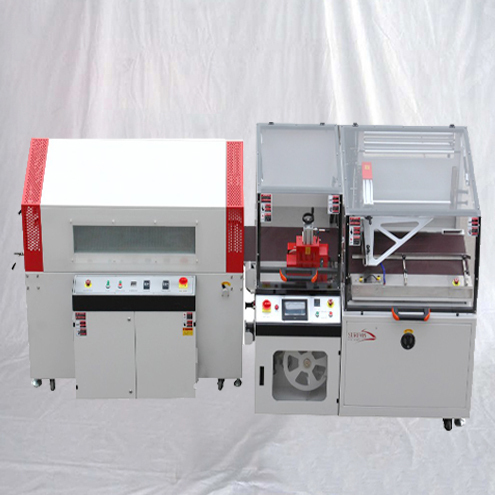 Sealing cutting coding system: it makes up by heating sealing mold, film cutter, film pressing tensioner, spot mark positioning system and waste film collecting function. 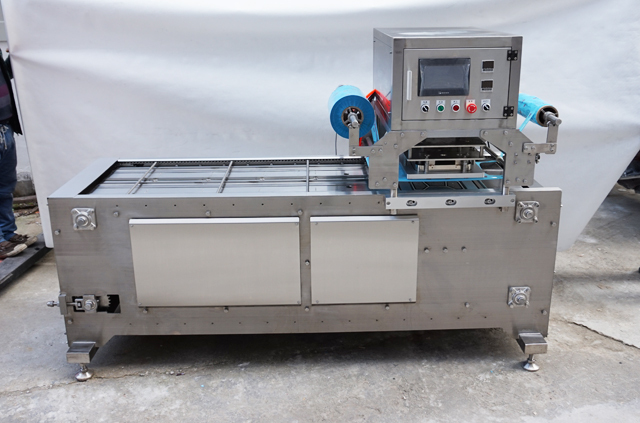 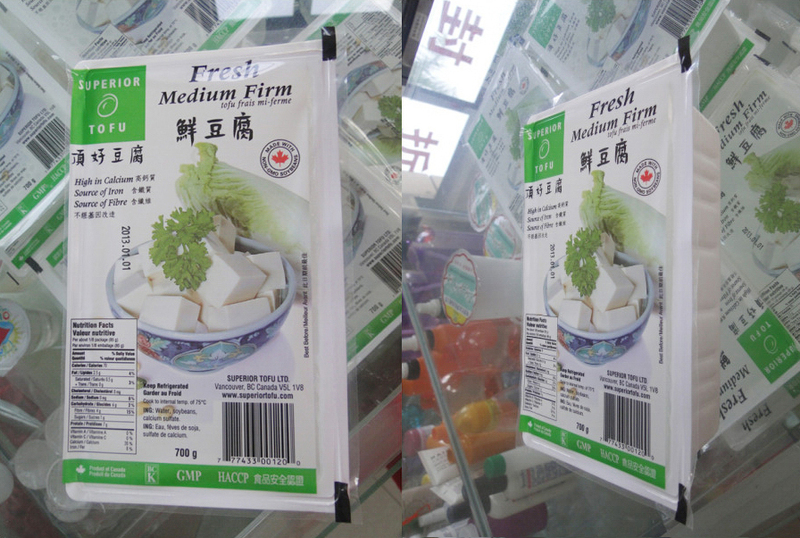 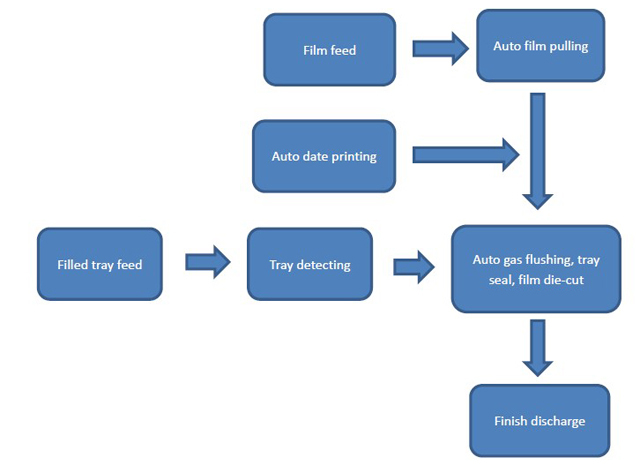 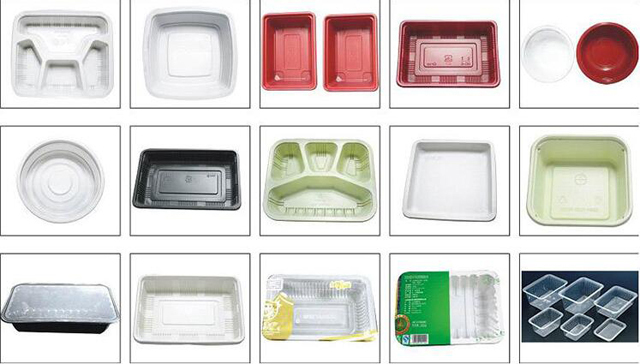 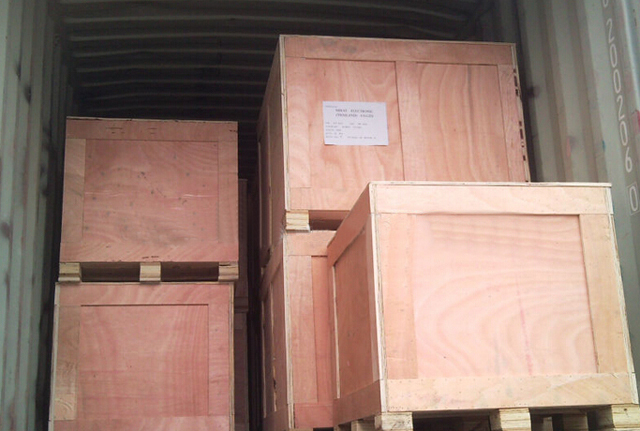 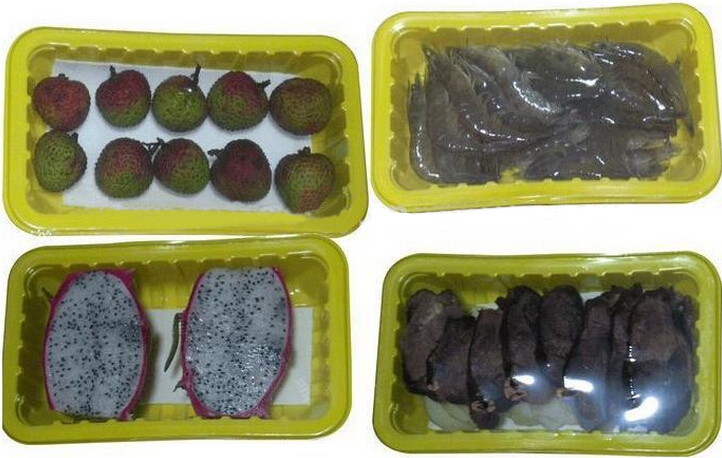 It can seal the tray, cutting the film and printing the produce date fast and accuracy. 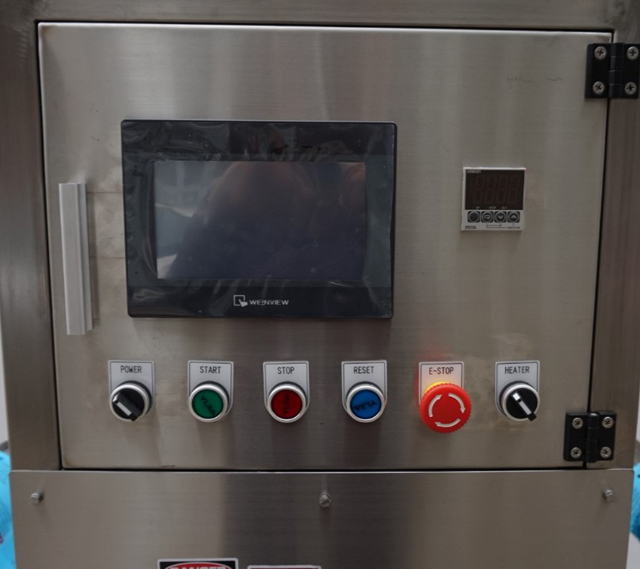 Automation control system: it make up by PLC, Touch screen, servo system, sensor, magnetic valve, relays etc. 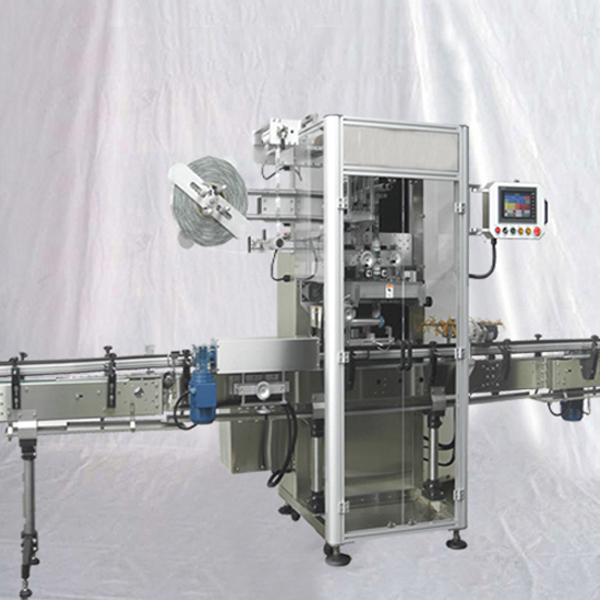 Pneumatic system: it make up by valve, air filter, meter, pressing sensor, magnetic valve, air cylinders, silencer etc. 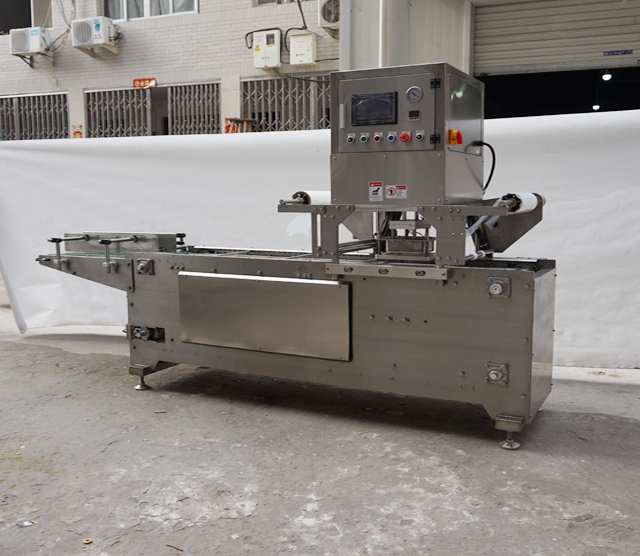 Safety guards: it is optional function, it makes up by PC plates and stainless steel, has safety switches which protect the operator.